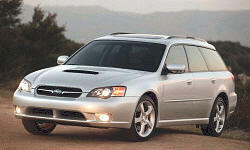 Subaru Legacy Pros and Cons | Page 1 of 4 | Why Not This Car? What drives people to buy (or not buy) a certain car? TrueDelta's members share Subaru Legacy pros and cons based on their real-world driving experiences. This is a great car with excellent MPG! For an AWD car when you need it for mountains and snow, it is about the only offering on the market that is a family sedan price and not a luxury brand. Great vehicle for handling, best in class for a mid size non premium brand. Essentially, I knew most of its issues before buying. I bought it because I enjoy driving, and this is an extremely versatile driver's car. Most repairs are cheap. Safety / visibility, utility, performance (and fun) are really what it's about. Very responsive when maneuvering thru city traffic. Nice chassis balance, adequate acceleration, excellent brakes, comfortable controlled ride. The body style of the 2009 is better than the 2011, the lines flow better. The outside is certainly better than the 2001 I traded in. I can easily fit three our four six foot adults in the car comfortably. Aggressive stance. A bit polarizing and unique. $5K or more cheaper than similar G37. $10-20K cheaper than similar BMW. The H4 2.5L engine has enough power to get the car around in town and on highway. More distinctive than the competition. Big improvement over past models. Had the previous model. I never had any problems, it was a solid car, as all Subarus seem to be. Amazing low end torque, spools quickly and is much faster then it looks. 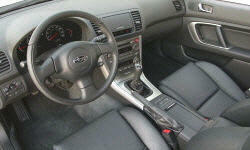 AWD 5 speed is like Launch Control. The stock tune is rich and leaves 50hp to play with.